The idea of ‘ley’ alignments is well attested. This article goes one step further and looks at the concept of landscape patterning at a regional and possibly national level that links primary sites in the southern area of England. 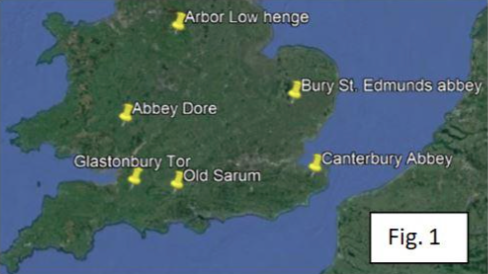 The six locations included in this study are Glastonbury Tor, the Cistercian abbey of Abbey Dore, the Arbor Low henge, Bury St. Edmunds Abbey, Canterbury Abbey (not the cathedral) and the Old Sarum hillfort. These sites range in distance from each other from 57 miles (Abbey Dore to Glastonbury Tor) to 178 miles (Canterbury Abbey to Arbor Low henge) – Fig. 1. A key supposition in this study is that the three monastic sites were built upon much older sacred places, whose origins date back to Neolithic times as postulated by Watkins (1974, p.117/8). A starting point of this pattern is the well-known Michael alignment between Glastonbury Tor to the abbey of Bury St. Edmunds first described by the late John Michell (1969) in his classic book ‘View Over Atlantis’. The section between Glastonbury Tor and Bury St. Edmunds abbey passes through the henge monument of Avebury and the twin circle pattern the formed the basis of my study in my book The Keys to the Temple (1997). The distance between the abbey of Bury St. Edmunds and Glastonbury Tor and is 165 miles set to a bearing of 244 degrees. It so happens that this alignment forms the hypotenuse of a right-angle triangle that also includes the site of the abbey church of Abbey Dore in Herefordshire. Abbey Dore is around 155 miles from Bury St. Edmunds on a bearing of 264 degrees giving an internal angle to Glastonbury Tor of 20 degrees with the angle from Glastonbury to Abbey Dore being 70 degrees (see Fig. 2). While one 90 – 70 – 20 degree right-angle triangle in the landscape might be a quirky coincidence and therefore of no statistical significance it can be shown that this form of patterning, using specific right-angled triangles, is not unique. 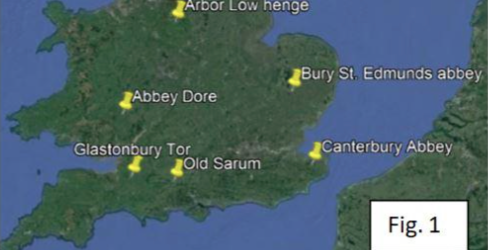 If we now include a further site of the well- known hillfort of Old Sarum we find the creation of another right-angle triangle fixed by the Old Sarum hillfort with its other two points of Abbey Dore and Bury St. Edmunds (see Fig. 3). In this case, the two internal angles are 60 degrees and 30 degrees. Effectively, we have half of an equilateral triangle with angles 90 – 60 – 30 degrees. Two such examples still do not prove a case, yet there is more. In my book The Keys to the Temple (1997), I postulated an alignment between Canterbury Abbey and Abbey Dore, a distance of 178 miles. This alignment passes through several significant sites including Rochester Cathedral, Greenwich Naval College, Bulstrode Hill Fort and Gloucester Cathedral. 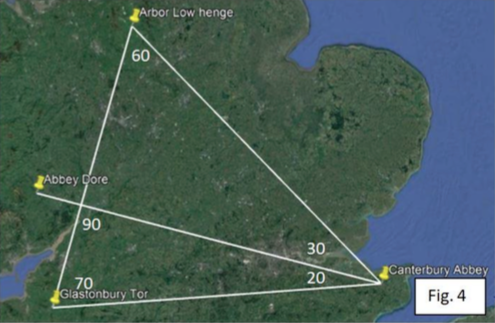 I also suggested a relationship between Glastonbury Tor, Canterbury Abbey and the Arbor Low henge, which form a triangle with internal angles of 70 – 60 – 50 degrees (see Fig 4). This specific triangular relationship (70 – 60 – 50) linking sacred places is not unique and can be found surrounding London with the sites of Boudicca’s Mound on Hampstead Heath, Greenwich in the east and Caesar’s Well on Wimbledon Common in the west. It also occurs in the connecting of the sites of Tewkesbury Abbey, Pershore Abbey and St. Michael’s church in Stanton. This triangle contains Bredon Hill with its ancient sites. In all these cases we have angular relationships based on ten degree steps. We now need to consider what might be significant about a seventy (70), sixty (60) and fifty (50) degree triangle. It so happens that this triangle is the product of two back to back right- angle triangles consisting of a 90 – 60 – 30 degree triangle and a 90 – 70 – 20 degree triangle (see Fig. 4). Therefore, the six sacred landscape sites of Glastonbury Tor, Abbey Dore, Arbor Low, Bury St. Edmunds, Canterbury Abbey and Old Sarum have a direct geometric link incorporating the three triangles in Figures 2 to 4. We can now join up all the dots to discover what else might be revealed. Further scrutiny reveals another right-angled triangle, which is focused on Arbor Low, with the adjoining sites in the triangulation of Abbey Dore and Bury St. Edmunds. The distance between Arbor Low and Bury St. Edmunds is 122.2 miles and from Arbor Low to Abbey Dore 95.6 miles. If we divide 122.2 by 14 and then multiply the new number by 11, we arrive at a distance of 96.0 miles, which is within 0.4 of a mile of the actual distance between Arbor Low and Abbey Dore. 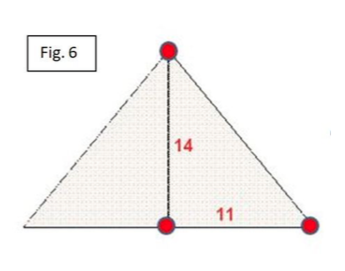 Effectively, this triangle is based on a ratio of 14:11, which is in itself very significant because it is the primary ratio of height to base of the Great Pyramid of Egypt shown in Fig. 6. Although unique in its size and construction the Great Pyramid is not the only Egyptian pyramid built to this ratio, which incorporates a method for calculating Pi (22/7). Put another way, if we imagine a circle being drawn with its radius the height of the pyramid, then the circle’s circumference would equal the distance around the four sides of the pyramid. The Ancient Egyptians set out their angles using tangent ratios of height to base such as can be found in the design of the Egyptian pyramids. If the landscape patterns indicated here are deliberate, then it would seem that our ancient Neolithic forefathers used similar methods. In the two original cases cited here a 90 – 70 – 20 degree triangle can be generated from a ratio of 11:4, while the 90 – 60 – 30 triangle can either be created geometrically or through a 19:11 ratio. With skill, time and patience it is feasible that these patterns could have been deliberately set out in the late Neolithic landscape that saw the construction of some of the most significant henges and circle sites in British history. Finally, the alignment between Old Sarum and Arbor Low is on a bearing, according to Google Earth, of 0.71 degrees, which is close to being north-south of each other. The six sites of this study have been recognised to hold spiritual significance and power. They can all be shown to conform to a simple, yet subtle geometric pattern that links them together despite the considerable distances involved. From archaeological studies carried out around Stonehenge, we know that the Neolithic peoples travelled long distances from the Orkneys in Scotland down to Salisbury plain for their ritual mid-winter feasting (Morris, 2017). They also invested an enormous amount of energy in building the magnificent structures, such as the Avebury henge, that we still see today. It is the suggestion here that these sites were not randomly chosen but adhered to a specific geometric plan of site relationship. There is not space within the context of this article to explore potential reasons why this patterning might have been created. However, it is quite conceivable that groups of people could have gathered at these sites on specific calendrical dates of the year, such as the mid-winter solstice, to link up these energies. David Furlong has been researching landscape patterns from more than forty-five years. He is the author of ‘Keys to the Temple’ which explores the twin circle landscape patterns of the Marlborough Downs and ‘Working with Earth Energies’.